Poor Posture causes body pain and stress. This can lead to upper back and shoulder weakness. When no pain is present, Chiropractic adjustments (to allow more spinal load during the motions) and these simple shoulder exercises will begin your recovery. 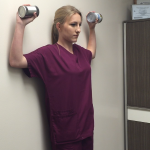 First exercise: keep elbow against the wall and tucked into your side. Turns arms out toward the wall, then back in. Second exercise: elbows level with the shoulders, with arms straight out. Bring your arms up toward the wall, then down to the starting point. Third exercise: With hips against the wall move the feet forward one foot. Also, angle your body 10 degrees off the wall. Keeping the hand facing downward, raise the hands with elbows slightly bend to below shoulder height. Hold for 1 second, then lower. With each exercise, only go as far as you can where it feels like a stretch. Barbara has seen Chiropractors since she was 12 years old. Dr. Ratkovic will explain the reasons for back pain and how to resolve them. Great time speaking at Baldy View ROP’s healthcare class’s 45+ students about how to serve others. Thank you for having me, and I’ll see the afternoon class in the near future. “Thank you so much Dr. Ratkovic. Your body’s nervous system can go under stress through a lack of motion, poor attitude and poor diet. Jamie talk will hopefully gives us all simple ways to eat healthy. If you can make it, I am sure you will not be disappointed. What the introduction video now. We will be open this Saturday, June 11th. 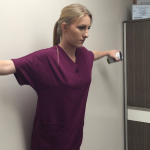 For over 7 years, Euclid Chiropractic has motivated local students to experience a busy healthcare environment. As results show, these young adults become a caring and competent health assistants. Enjoy understanding how Essential Oils place a unique role in health as you receive a complimentary massage. Find out how to set up your proper posture quickly every time. This will help you avoid back and neck pain BEFORE starting any exercise routine. Stand against the wall with your heels, hips, shoulders and head against the wall. Hold the position for 6-10 seconds against the wall to set it your posture. Holding the position, then take one step forward putting your weight on our heels. There you go! Now you ready to start your exercises with this better posture. Any questions or problems? Check with your Chiropractor for a posture exam.